Passengers of JetBlue flight 387 arrive at the airport in Santa Clara, Cuba, Wednesday, Aug. 31, 2016. 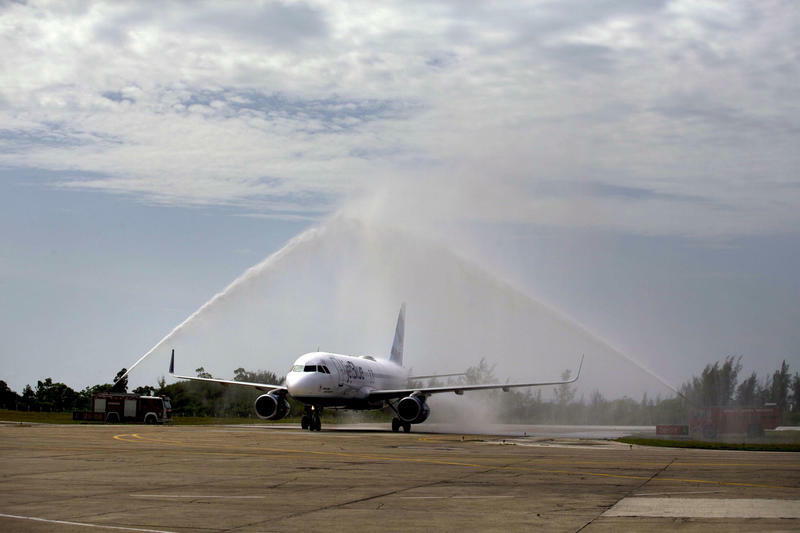 Firetrucks spray water over JetBlue flight 387, "baptizing" the first commercial flight between the US and Cuba in more than half a century, after touching down at the airport in Santa Clara, Cuba, Wednesday, Aug. 31, 2016. Passengers of JetBlue flight 387 holding a United States, and Cuban national flags, pose for photos in front of the plane transporting U.S. Transportation Secretary Anthony Foxx, at the airport in Santa Clara, Cuba, Wednesday, Aug. 31, 2016. 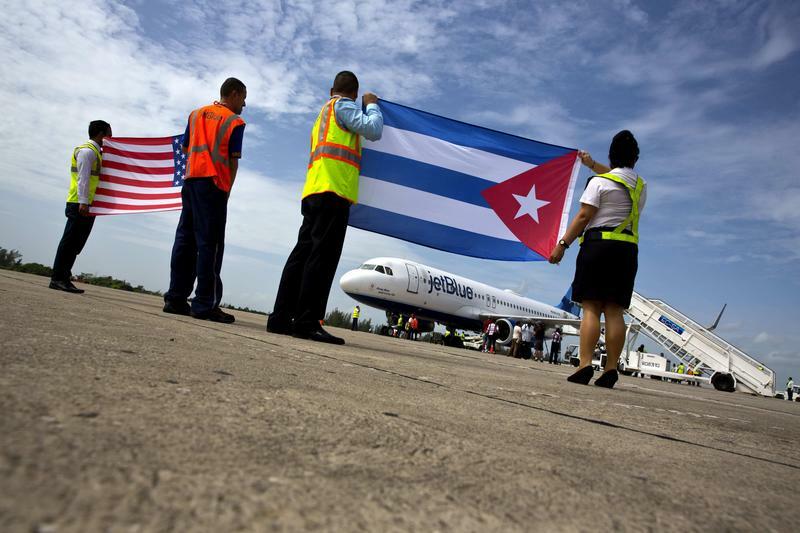 Airport workers receive JetBlue flight 387 holding a United States, and a Cuban national flag, on the airport tarmac in Santa Clara, Cuba, Wednesday, Aug. 31, 2016. 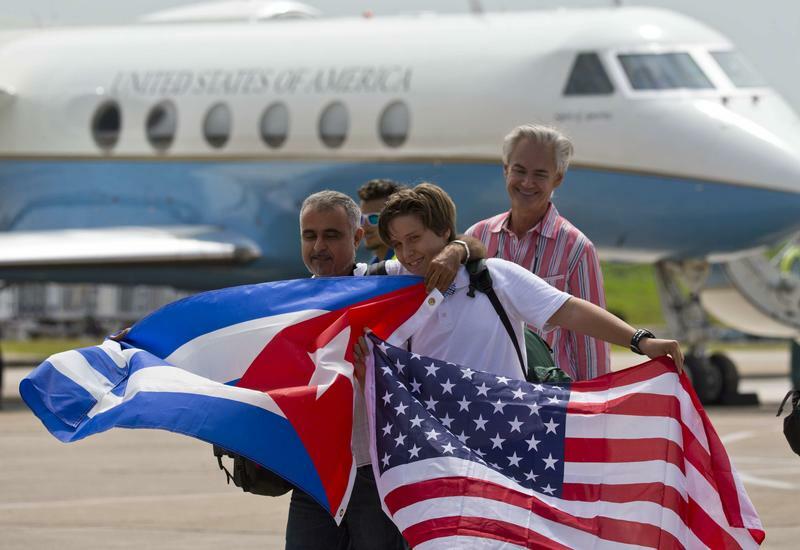 "This is the most important flight of my life," said First Officer Francisco Barreras, a Cuban-American. In fact, Barreras’ family story reads like a passage from a history book of Cuban-American air travel: His great uncle was the general manager for Pan Am in Havana, who later took part in Operation Peter Pan. 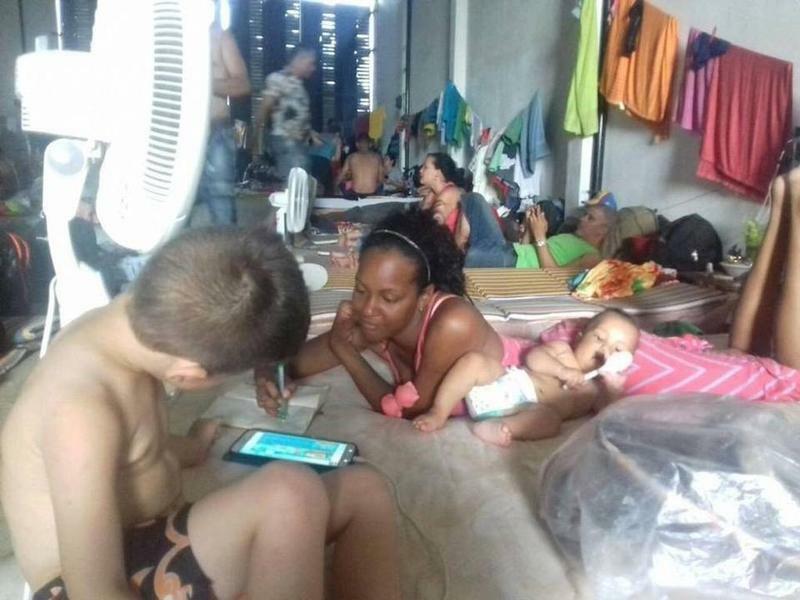 The operation provided air transportation to the U.S. for Cuban children. Another family member was a pilot for the Castro family. Barreras has flown many charter flights to Cuba, but he said this flight was the most important one of his life. The captain was another Cuban-American. Mark Luaces was born in Miami and his father was an aircraft mechanic for Eastern Airlines. There was Cuban-themed cake - for example in the shape of a cigar box. JetBlue was not afraid of clichés: There was a chocolate cake that looked like a cigar box and boarding started to the sounds of Buena Vista Social Club. Of the 150 people on board, most were journalists and airline officials. Sixty were regular travelers, according to the airline. One of them was 53-year-old Dominic Santana, who wore a baseball cap and a T-Shirt that read USA. He left Cuba when he was 8 years old and had never been back since. Dominic Santana, who said he would go by the name Domingo again when back in Cuba, will spend a week there before returning to Miami. First Officer Barreras echoed the sentiments: "Let change happen," he said. "It's going to be a good thing for the Cuban people, a good thing for Cuban-Americans." 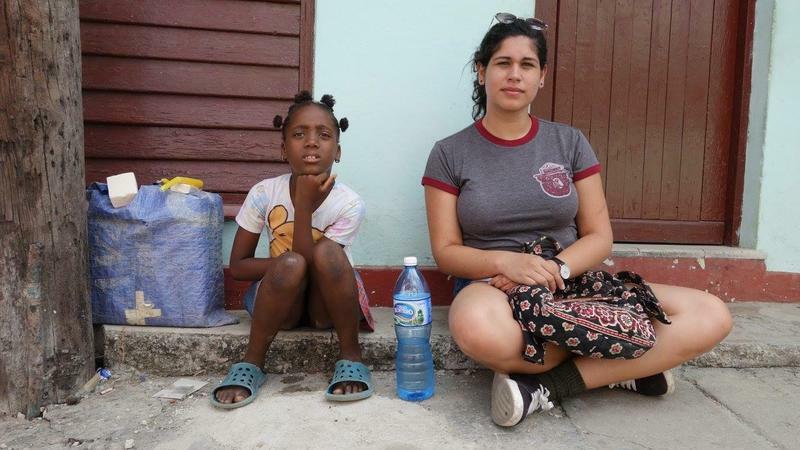 The flight to Santa Clara, about 175 miles east of Havana, took just 45 minutes. There the plane and its passengers were greeted by a reception. 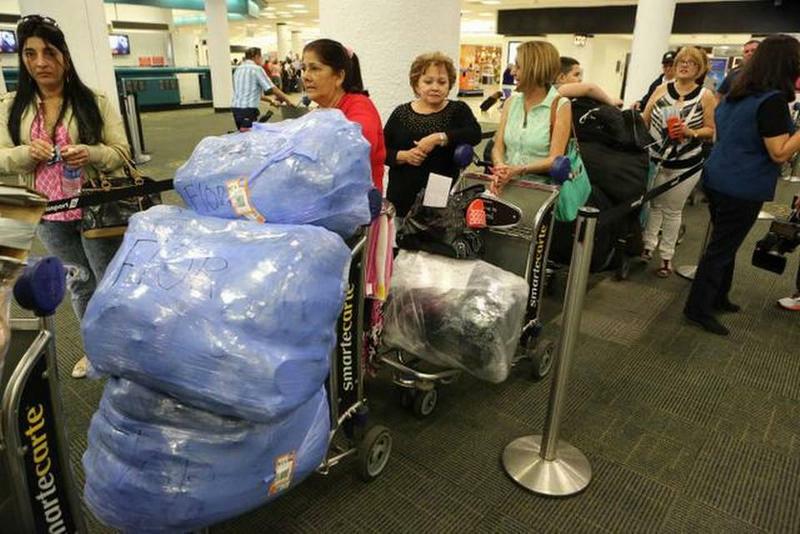 Cuban aviation officials said that they were prepared to allow up to 110 flights a day by North American airlines. 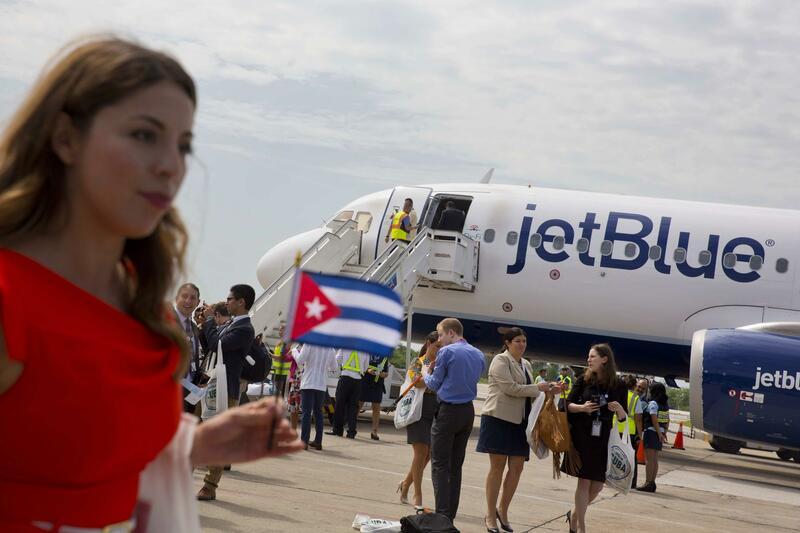 So far, 10 U.S.-based airlines have been approved for scheduled service to Cuba. My mother says I’m American. I was born in Miami, Florida, so she is technically correct. But like many other Latin Americans who grew in up the United States, I carry with me the values and traditions of my ancestors. So I’m Latin-American --I’m a mixture of my mother’s Cuban heritage and my father's Peruvian heritage. Thanks to them, my American upbringing had a pinch of Latin spice to it --like literal aji amarillo, or yellow pepper, with some sweets too like my favorite red guava jelly. 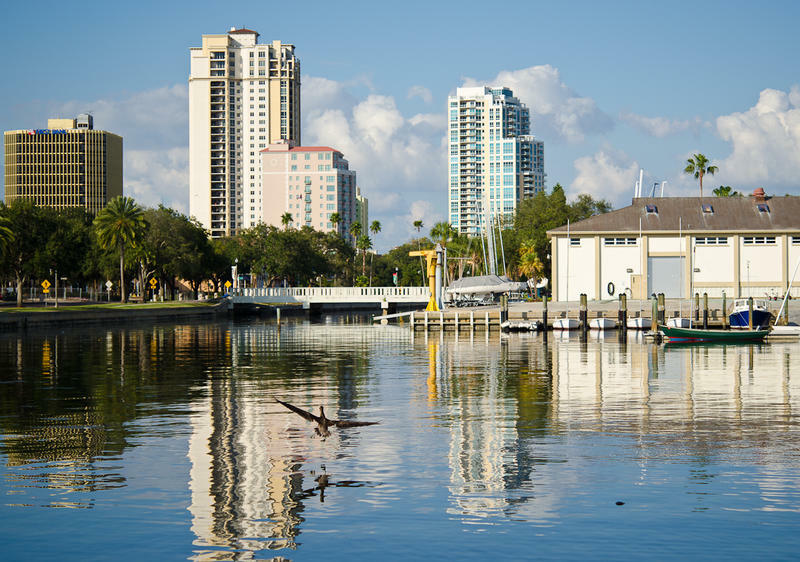 St. Petersburg appears to be out front in a bid to become home to the first Cuban consulate in the United States in more than five decades. Since the U.S. and Cuba normalized relations almost two years ago, Cuban migration here has surged. But a new study shows us just how dramatic that wave has become.